Come all ye fighting soldiers. And Scotsmen frae the glen I’II sing to ye a marching song, About the gallant men, Who left their hills and valleys, their barley for tae rot, Tae fight for dear old Scotland Wi' the Gallant Royal Scots. 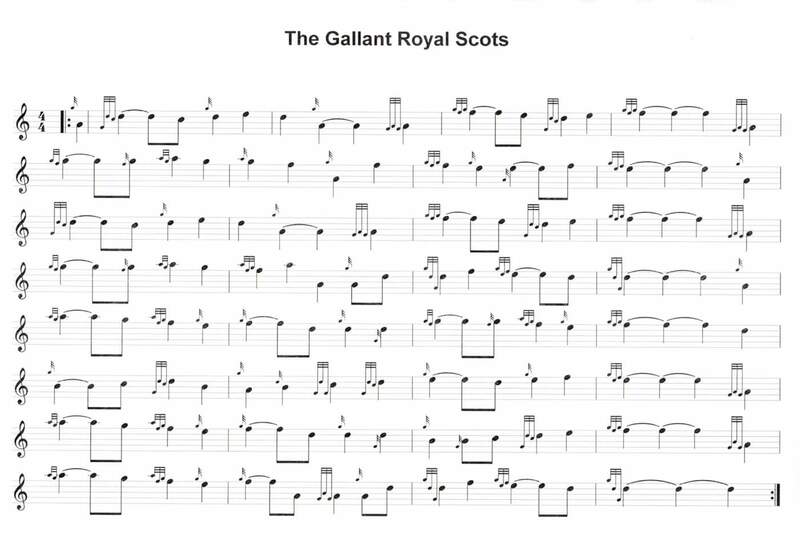 When Royals go a-marching When Royal Scots leave hame ye’ll hearthe drums a birtin' Tae the bagpipes cheery strain, And when they a' come hame again, Wi badges on their coats, We'll a'go doon and gie a cheer For the Gallant Royal Scots. Tis said that Pontius Pilate, The great High Chief of Rome, Made the Royal Scots his Bodyguard, When he was far frae home, To fight for peace and country, To fight for haughs and cots, Mid mountain glen and heather Wi' the Gallant Royal Scots. When Royal Scots go marching, Tae leave Auld Reekie'e streets, Sair hearts they leave behind them, And WI’ lassies braw and sweet, ye’ll hear a shout go soaring, Frae Leith tae John o' Groats, When E'nburgh ships come sailing in, Wi' the Gallant Royal Scots . So here's tae all my comrades, your regiment is mine, And proud is every soldier, who is Right O'The Line, They've fought many battles, Namur tae the Somme, And in the hills and glens of hame You'll hear their battle song.